Local Macdonough Elementary Students Go on a Math Field Trip to CHC! One of the most important things I have learned over my first two months of serving within the Community Health Center, Inc. is to always try and keep the community feeling like they have a sense of involvement. In Middletown, the construction of the new medical building is something that grabs your attention when you are passing through Main Street but sometimes people can forget amongst the bare structure and production, the sole purpose of the new building, which is mainly to serve the people who live around it. A perfect example of this idea was reminded to me after accompanying local elementary students on their “Math Field Trip” to the construction site during the early afternoon on Tuesday. Five students got a chance to experience a unique lesson about the mathematic aspect of designing a large building and how it looks during its early stages of construction, inside and out! “Numbers are like a door into making things in life that are beautiful” said the Architect of the new Middletown Community Health Center Building, Robert Olsen. Five fifth graders sat around the table listening intensely as the Architect spoke about the very math topics that they were learning in class; geometry, bar graphs, pictographs, and axis were all terms that the students were familiar with. 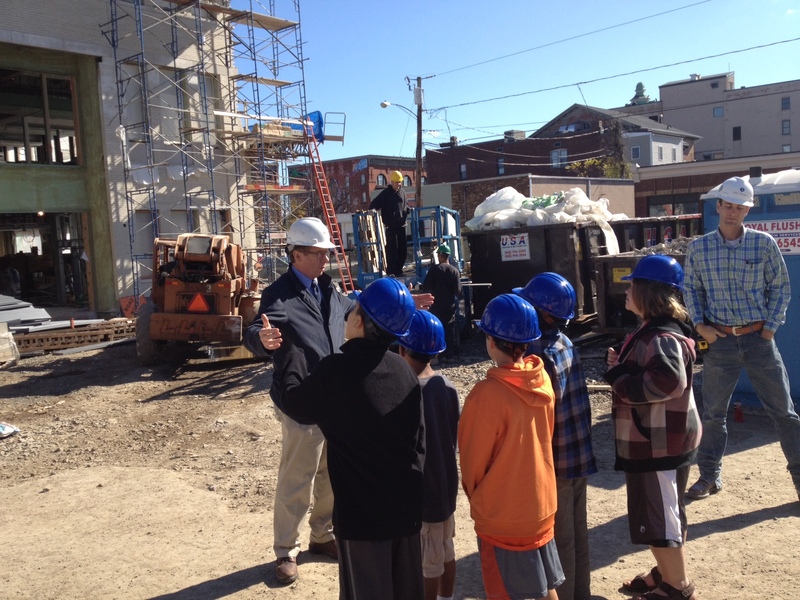 The students from Macdonough Elementary school walked to and from the construction site office with Mark Masselli for an hour long lesson in math, but this was nothing like sitting in the classroom. Each student was given a hardhat to wear before they got to walk across the street to the actual construction site to see how a building looks during the assembling process. With a paper and pen, Olson demonstrated how to start a building layout and discussed how math and philosophy have been connected and highly important for almost eternity. He brought up the concept of the golden triangle and continued to talk about Pythagoras’s theorem. 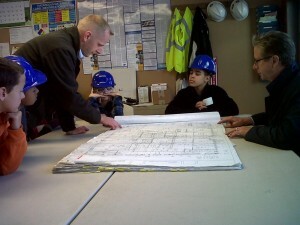 The students were able to ask questions and look at the detailed blue prints of the building. Before they left the office, the fifth graders were told to pay attention to their math because it goes into everything in life. Once they got a feel of how math is connected with architecture, the site conductor gave the students a quick talk about the importance of construction safety, their hardhats were put in place and they were off to see the work in progress. The students were more than excited to see the exposed elevator shaft, visible beams holding up the structure and the entire base floor layout. Since the building will not be done until early spring, the students will be brought back a few more times to see the actual progression of the building. It was a great feeling to see students so connected with math and architecture, something that usually doesn’t excite most fifth graders!